On September 11th the BBC News website’s Middle East page published an article titled “Israel orders criminal investigations into Gaza war incidents“. “Israel is facing a series of steps in the international arena in the wake of the Gaza conflict. 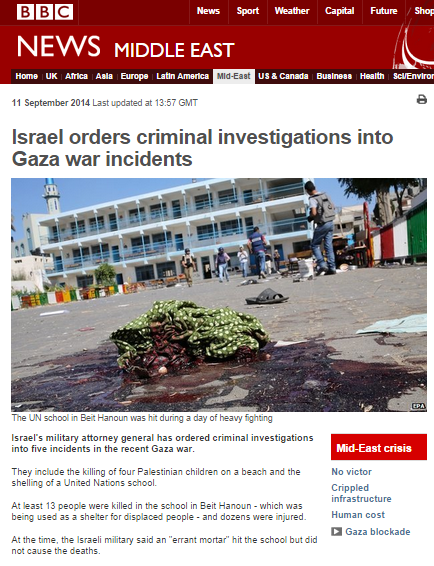 Notably, the BBC refrains from pointing out to readers that the UN HRC commission’s mandate charges it with the investigation of “all violations of international humanitarian law and international human rights law in the Occupied Palestinian Territory, including East Jerusalem, particularly in the occupied Gaza Strip, in the context of the military operations conducted since 13 June 2014”. In other words, the kidnapping and murder of three Israeli teenagers by Hamas terrorists on June 12th is not part of this already problematic investigation’s mandate. But the most remarkable part of this article is its amplification – yet again – of claims made by the political NGO Human Rights Watch. “New York-based Human Rights Watch carried out its own research into what it says were Israeli attacks that damaged UN schools in Beit Hanoun, Jabaliya and Rafah, killing a total of 45 people, including 17 children. The human rights group says that the first two attacks “did not appear to target a military objective or were otherwise unlawfully indiscriminate” and that the third incident was “unlawfully disproportionate if not otherwise indiscriminate”. But beyond the fact that the BBC provides promotion and amplification for HRW’s ‘report’, what is noticeable is that once again it does so without informing BBC audiences that HRW is not a neutral human rights organization but one of several political NGOs currently engaged in lawfare against Israel. Until the BBC begins to adhere to its own editorial guidelines on impartiality by ceasing the now commonplace practice of avoiding informing audiences of the political agenda of its preferred NGOs, it can only be considered as a self-conscripted party to that political warfare. Elder of Zyon has very thorough analysis of the completely ‘unbiased’ position of HRW’s CEO.